The complete bulkhead mounted terminal box for the Model A Ford. Comes with mounting hardware, wing nuts and cover. Terminal Box Screws 1928-31. The Four screws needed to mount the terminal box to the firewall. Made in USA. Firewall terminal box lid for the 1928-31 Model A Ford. This is the lid only for the terminal box. Brass Wing Nut set 1928-31. For the terminal box. Wiring retaining clip for the 1928-31 Model A Ford. These are used on the water inlet pipe, the speedo cable beside the firewall and the Cut-out wire on firewall. Terminal box Wire Clip 1928-30. This clip holds the cut-out to terminal box wire on the firewall. For the early style with steel conduit. Made in USA. Wiper Cowl Wire Support 1928-29. This unique clip was held in place by a bolt that held the gas tank to the cowl. It served as a grommet holder for the wiper and or dome lamp wire, and the other part of the clip held the top of the kick panel in place. Grommet included. 2 required. Made in USA. 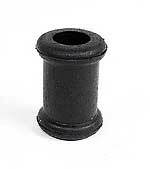 Wiper Cowl Wire Support Grommet Only. Made in USA. Firewall Grommet Set 1928-31. All the grommets you will need for the firewall. (Not for indented firewall). Made in USA. All the grommets you will need for the firewall on the late 1931 Model A Ford. Made in USA. Note: The late 1931 grommet set is for A's with the indented firewall for the gas valve.